Growing Virtual CFO Trend- Everything Your Business Needs To Know. Getting a startup or small business running efficiently and effectively may take some time, especially if your company lacks financial intelligence. In fact, a significant reason that small businesses fail in the first thirty-six months of operation is financial incompetence. The importance of accurate bookkeeping, maintaining budgets, tracking profits and loss, and managing your cash flow could determine the survival of your business. Now more than ever, startups and small businesses are looking for ways to cut costs and run lean. CFO services for startups and small businesses provide just a way of doing that while offering top expertise in managing your companies financials. Although virtual CFO services have been around for quite some time, growing awareness of their benefits is on the rise. You may be curious why Virtual CFO services are growing now more than ever. The simple answer to this is the accessibility of cloud technology. Cloud technology has been instrumental in opening up the ability of Virtual CFO’s for small and medium-size businesses. This advancement in technology allows your business to receive expert and broad support over your entire financial process, without having to employ a full-time staff member. What Services Do Virtual CFOs Offer? Virtual CFO’s can be extremely helpful to growing businesses as financials become more complex, and it becomes more complex to manage and measure cash flow, inventory, production costs, and other critical financial information. Improving accounting processes and systems will be the main priority for a Virtual CFO as well as implementing new technology where needed in the governance structures. Another major benefit of a Virtual CFO is their expertise and ability to identify and manage bookkeeper/controller to produce reliable data and interpret the results, helping align your company on the right path to achieving it’s stated goals. Additionally, an experienced CFO has the ability to recognize and cut waste, deploy cash efficiently, and find opportunities in the marketplace for greater production or expansion that would otherwise go unnoticed. Still not convinced this is a viable option for your organization? There are plenty of additional reasons a Virtual CFO could seriously be the right option for your business. In fact, a Virtual CFO is proven to be less expensive than the large salary of an in-house CFO with similar experience. A virtual CFO does not require bonuses or benefits and the pricing will be determined only on the amount time and deliverables your organization requires. Along with being economical, your Virtual CFO will also have multiple industry experience. This could be an awesome opportunity for multilayered insights and networks your business may not have otherwise had access to. Additionally, hiring a Virtual CFO means there’s a smaller learning curve. Typically, it takes six to twelve months for a new employee to get up to speed and perform at their maximum potential. However, a Virtual CFO is trained and has much experience entering organizations mid-process, that they will be able to make impacts and achieve goals more quickly than hiring an in-house CFO. Virtual CFO’s have the ability to quickly asses the current situation and implement actions to achieve success. • Do you know your exact production and labor costs? • Are you accurately and effectively compiling and organizing relevant data that your accountant will use for tax filings? • Is all necessary financial data being recorded in the correct place? • Do you know which products and services are performing best? • Are you able to accurately analyze, measure, and track your profit margins? • Are you using this information to make better-informed business resulting in higher profitability? If you are unsure of the answers to any of the following questions above, your company may want to consider hiring a virtual CFO. The individual selected can be a much-needed sounding board, coach, or guide that can analyze existing processes and offer solutions for higher optimization. Limitless Investment and Capital’s Virtual CFO Services in Detroit, Michigan. 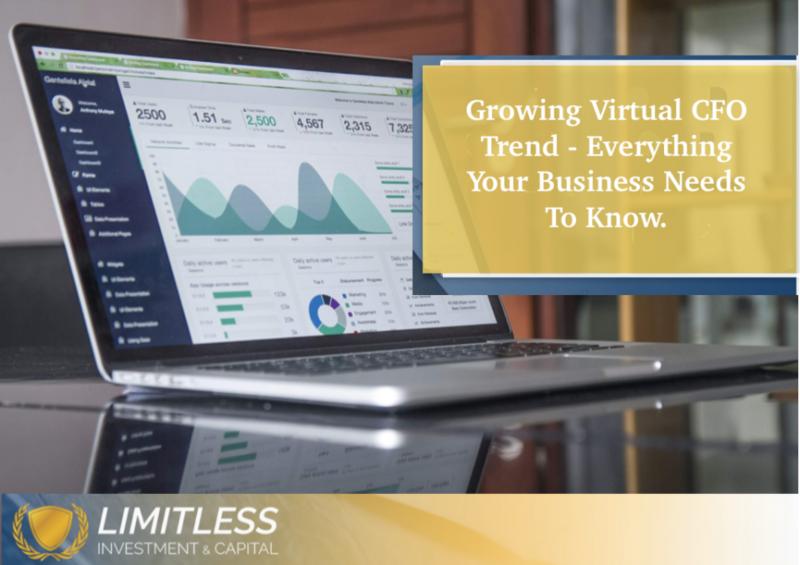 At Limitless Investment & Capital, our virtual CFO’s will help your company grow sales, cash flow, and profit. Our CFO services for startups can drive growth and profitability for your company anywhere from 5 to 36 hours per week, based on your needs. Depending on the size and the growth stage of your company, we provide a flexible engagement model, enabling you to increase/decrease engagement levels, thereby giving you the opportunity of having the best CFO talent assisting you, based on your needs. Interested in a Virtual CFO? Get in Touch and receive 5 free hours in the first 60 days upon signing an annual contract!